The Grace consortium held its official kick-off meeting on 12 January 2017. The project officially started on 1 July 2017 and will run until 1 July 2020. The consortium consists of Istituto Nazionale di Ricerca Metrologica (INRiM), Centro Español de Metrología (CEM), NPL Management Limited (NPL), Das-Nano SL, Graphenea, ISC International Standards Consulting GmbH & Co KG (ISC), the University of Manchester (UoM) and VDE Verband der Elektrotechnik Elektronik Informationstechnik eV (VDE). Since the discovery of graphene in 2004, both academia and industry have investigated this new 2D material extensively. However, for the electronics industry to consider this new material, large-area, high-quality graphene with uniform and reproducible electronic properties need to be grown successfully. Therefore, accurate and reproducible characterisation methods adapted to the 2D nature of graphene, both as test samples and in production lines, are crucial. Currently, such electrical characterisation methods for graphene are underdeveloped and lack guidelines for the proper implementation of such methods in an industrial environment. The main objectives of this project are: (1) the development of validated protocols for accurate and fast-throughput measurement of the electrical properties of graphene, for a Good Practice Guides (GPGs); and (2) collaboration with international standardization committees in order to initiate and develop dedicated standards for the electrical characterisation of graphene. Upon completion, this project aims to have a significant impact on industrial, metrology and scientific communities. Specifically, the GPGs, which will be developed in close collaboration with the project stakeholders committee, will help industrial end users in the practical implementation of different methods for electrical characterisation of graphene. Moreover, by improving the accuracy and reliability of measurements performed according to the GPGs, the project will have a direct impact on graphene growth methods and bringing graphene based products to market. 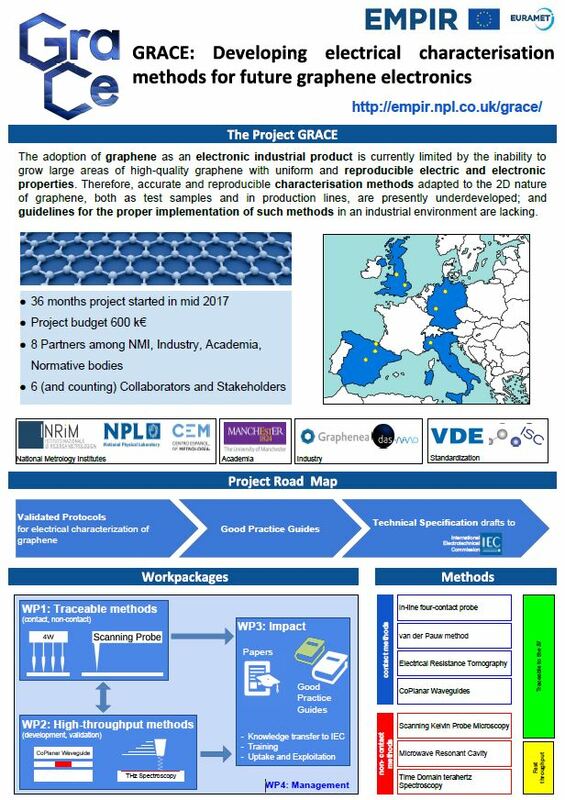 Finally, the project aims to contribute to the standards development work of IEC/TC113 and CENELEC WS SGRM, through the initiation of development of newly-written standards for the electrical characterization of graphene based on the GPGs.